RIT Big Shot No. 33 is scheduled, rain or shine, for Sept. 29, when the photo team will point its cameras at historic Old Fort Niagara in Youngstown, N.Y. Shown above is a detail view of the larger panoramic shot. A historic fort with a past that spans more than 300 years will be the focus of RIT’s Big Shot next month, as the community photographic project travels to the Canadian border to capture a dramatic nighttime image. Old Fort Niagara, located in Youngstown, N.Y., on the eastern bank of the Niagara River at its mouth on Lake Ontario, will be the subject of RIT Big Shot No. 33 on Sept. 29. Originally built in 1726, the fort is the oldest continuously occupied military site in North America. In 1934, Old Fort Niagara opened as a historic site and public museum. The fort includes the six oldest buildings in the entire Great Lakes region and serves as Western New York’s only tangible link to the Revolutionary War period. Old Fort Niagara is a Registered National Historic Landmark and New York State Historic Site, operated by the Old Fort Niagara Association in cooperation with the New York State Office of Parks, Recreation and Historic Preservation. The Big Shot, described as “painting with light,” engages student and community volunteers to provide the primary light source for the image while RIT photographers shoot an extended exposure. It’s a signature event for RIT’s College of Art and Design—formerly the College of Imaging Arts and Sciences—and is led by the School of Photographic Arts and Sciences (SPAS), nationally recognized for its degree programs. 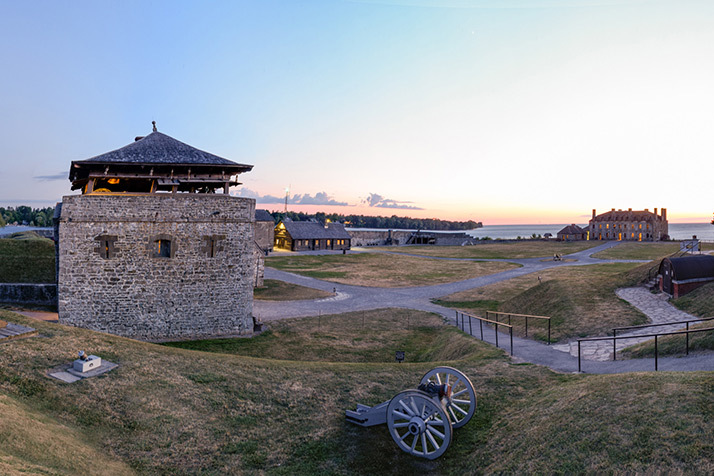 “Old Fort Niagara was chosen because it’s a dramatic and historic landmark that will be photographed in a way it has never been before,” said Michael Riordan, a lecturer in RIT’s School of Media Sciences who grew up in Youngstown and proposed the venue to RIT’s Big Shot team. While plans are still being finalized, organizers are considering featuring the discharge of a cannon in each of the four exposures planned for the evening; including more than a dozen reenactors in the image; and using six cameras to produce the panoramic view necessary to make the shot of Old Fort Niagara even more compelling, said Daniel Hughes, a SPAS lecturer and another member of the Big Shot team. “It’s our pleasure to work with RIT on staging this Big Shot photo. The idea of featuring a historic site in this modern way will certainly help bring new awareness of Old Fort Niagara to a broader audience,” said Robert Emerson, executive director of the Old Fort Niagara Association. The Big Shot photograph is scheduled to be taken soon after sunset, around 8:30 p.m., regardless of weather conditions. Volunteers are asked to arrive by 8 p.m., bring either a flashlight or a camera flash unit, and wear dark clothing. Volunteer registration is scheduled to open Sept. 1 at www.oldfortniagara.org. Participants will be separated into lighting teams and positioned by organizers before test photos are taken and the final photo is captured. Complimentary memento prints will be produced for participants and be made available soon after the event. Nikon Inc., a longtime sponsor of the Big Shot, once again will be the event’s premier sponsor. Additional sponsors include Profoto, which will provide specialized lighting equipment, including powerful battery-operated electronic flash systems and Kodak, which will assist with printing the memento prints. RIT began its Big Shot project in 1987. The event has traveled to several national landmarks and twice crossed the Atlantic Ocean. Through their viewfinders, Big Shot photographers have captured landmarks in the United States such as Kodak Tower in Rochester, N.Y.; Churchill Downs in Louisville, Ky.; AT&T (formerly Cowboys) Stadium in Arlington, Texas; and the Smithsonian National Museum of the American Indian in Washington, D.C. Internationally, the RIT team has captured Pile Gate in Dubrovnik, Croatia, and the Royal Palace in Stockholm, Sweden. To learn more about the project and view photographs of past Big Shot images, go to https://www.facebook.com/RITBigShot or http://bigshot.cad.rit.edu. The project also can be followed on Twitter at @RITBigShot.